This revised edition, first published in 2007, is an unabridged and corrected republication of the second edition of this book published by McGraw-Hill Publishing Company, New York, NY, in 1988 (ISBN 0-07-047794-9), and also published earlier by Macmillan, Inc., New York, NY, 1988 (ISBN 0-02-389380-X). All copyrights to this work reverted to Sophocles J. Orfanidis in 1996. The book is freely available online as a single PDF file. A low-cost print-on-demand paperback copy can be ordered from here. A print-on-demand hardcover version is also available. The C and Fortran functions were listed in Appendices A, B, and C in the 1988 McGraw-Hill edition. To save space, these appendices have been eliminated from the current edition. A newer and much expanded edition (2018) is available here. Copyright © 1996-2007 by Sophocles J. Orfanidis, All Rights Reserved. This book may be downloaded freely and printed for personal or educational use only, as long as the printed or photocopied pages are not altered in any way from the original PDF file posted on the book's web page. The book's web page is www.ece.rutgers. 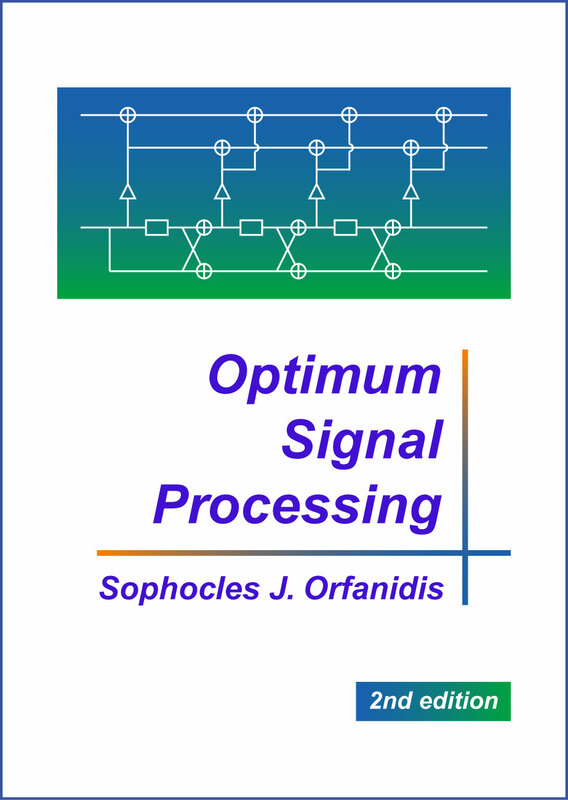 edu/~orfanidi/osp2e, and links to this page may be placed on any web site. No part of this book may be reproduced, altered in any way, or transmitted in any form for commercial, profit, sale, or marketing purposes. The supplied MATLAB, C, and Fortran programs are for educational use only. They were designed to illustrate various concepts in this book. The author makes no warranties of any kind, expressed or implied, with regard to these programs or their documentation. The author shall not be liable in any event for incidental or consequential damages in connection with, or arising out of, the furnishing performance, or the use of these programs. These programs may be distributed freely, as long as they are not modified in any way. MATLAB is a registered trademark of The MathWorks, Inc.
As far as possible, the MATLAB functions use the same input and output variables as the C and Fortran functions.